At one time, Korean women enjoyed an almost equivalent status to men in society. That changed over the course of the Chosun Dynasty, when Confucianism gained momentum. During this period women were primarily relegated to the home. Days of Future Past, curated by Simon Kwon, Director of SM Fine Art Gallery, examines the changing gender roles in Korea, and spotlights a new generation that is empowering youth and changing culture. With the rise of Confucianism, Korea saw a resurgence in traditional gender roles and social hierarchy. Korean women were dissuaded from artistic expression. However, since the Korean War, society has changed dramatically. “The new generation of Koreans is free to pursue their dreams regardless of gender. Mari Kim is a product of this new environment for younger generations. Her work has been influential in Korea and has been steadily growing an international following. In a country where it was taboo for women to be expressive, she is now a major influence on popular culture.,” states Simon Kwon, curator of Days of Future Past. 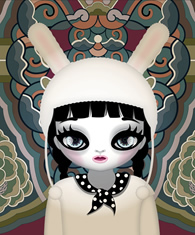 Days of Future Past is a special solo show of Mari Kim’s artwork. Heavily informed by her training in animation, Mari Kim incorporates bright colors and bold lines to create simplified and idealized figures. Most of her works depict young women and many include fairy tale or other popular characters. Kim’s works are in the collections of the Seoul Museum of Art and the Gyeongnam Art Museum in Korea. She has exhibited in numerous museums including: Jeonnam Art Museum, Jangheung Art Park, National Museum of Contemporary Art, Seoul, and the Korea Advanced Institute of Science and Technology, among others.